Sharon was a great tour guide, and responded very quickly. Since we didn't have much time in San Francisco, she gave us a brief overview of the neighborhoods and major sites. TOUR GUIDE RESPONSE: Dear Lauren, Thanks so much for your kind words and for taking the tour. It was a pleasure meeting both of you Hope you come again Sharon T.
Excellent tour - it was raining so we did not get out and walk as much as we normally would. Obviously the weather is not the guides fault. Guide was knowledgeable and made sure she covered all the places on our "must see" list. Sharon provided a lovely 4 hour overview tour of San Francisco for my 13 yo daughter and me. Her vehicle is comfortable and clean, and she is a careful and safe driver. Sharon listened to my special requests and fit everything in within our allotted time frame. She was kind enough to drop us off at the place of our choosing when the tour was done. My daughter and I loved the historical background/context that Sharon was able to provide; this helped us enjoy the city more for the rest of the trip! Thanks for a great tour of San Francisco Sharon. We enjoyed learning all about the history of San Francisco and visiting the different neighbourhoods. We also loved seeing SF from so many different locations and were impressed with your photo taking ability. Such a great tour! Sharon did an amazing job customizing our tour so our family of 4 could see everything they wanted to. We were able to see places we wouldn't have found on our own (Golden Gate Fortune Cookie Factory in Chinatown and Lucasfilm in the Presidio). 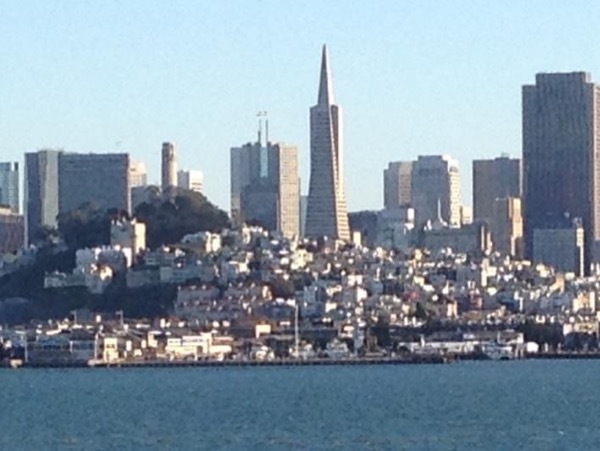 Lots of great and interesting information about San Francisco. Would highly recommend one of her tours! TOUR GUIDE RESPONSE: Dear Janna, Thank you for your review. I hope you enjoyed the restaurant last night and I wish you well on your further travels. Sincerely Sharon T.
This was an outstanding tour during which we learned a tremendous amount about San Francisco. Sharon did a remarkable job of bringing us to, and providing detailed explanations of, a huge amount of historical and current information that was both germane and in perspective. Sharon is personable, helpful, and flexible in providing exactly what we wanted to see and learn. We would book this tour again if we were new to SF. Thank you, Sharon! We had a wonder time. We are 3 retired ladies who had a few extra days to see San Francisco before boarding a cruise ship. Booking an apartment a little out from downtown was not an issue because Sharon picked us up at our door. We spent the next 8 hrs seeing all the hot spots of the city. We even got to ride a cable car. Sharon shared the history of the city as we rode. We chose not to cross the bridge which gave us all day in the city. It turned out to be a very wonderful day. Sharon is an amazing guide, she really made the difference! It was very easy to organize an adaptation of a tour for our group - walking and bus 5h (21 people including children) considering our interests, needs and Sharon's experience. She is really knowledge about history and actuality of the city... she adapts the tour accordingly with the on-going conversation and makes the most to surprise you. Sharon is a great guide. We could not have been more pleased. She was prompt and very knowledgeable. We would highly recommend her. Sharon is amazing. She designed a perfect custom tour for us. She was kind, friendly, knowledgeable, and fun. We highly recommend her. Sharon is a wonderful host and guide. TOUR GUIDE RESPONSE: Thank you so much. It was my pleasure to show you the Woods and the area. We spent Spring Break on a trip to the Monterey Area. It was me, my husband and our 12 year old daughter. Sharon was a wonderful guide and included all of the sights we were interested in. Our 12 year old daughter had a wonderful time and was engaged the entire time. Sharon was an excellent guide-knowledgable, accommodating, and professional. We enjoyed a 6 hour tour, despite the very rainy weather. I would recommend Sharon for any San Francisco tour. Sharon was a thoroughly informative and gracious guide. We learned so much more by touring Chinatown with her than we would have on our own. Highly recommended. Our family with two kids had an 8 hour tour of San Francisco. Tour was very well organized and prepared. Sharon is very knowledgeable and we got a great overview of the city. Sharon arranged a wonderful private walking tour for our group of the Barbary Coast and China Town with an historical emphasis. After getting a feel for the group and the varied interests, she was able to adapt the tour as we went along. Highly recommended! Sharon has an in-depth knowledge of the history, the Architectecture and the colour and flavour of San Francisco. She was able to put the story of the city across well. We very much enjoyed our tour. TOUR GUIDE RESPONSE: Thank you so much, Julia. It was a pleasure to meet you today and show you around. Please come again. Sharon did a great job and was very attentive to what we wanted to see. We feel we have had a very good mini view of all of San Francisco ! TOUR GUIDE RESPONSE: Thank you Daria, Congrats to you and Jim on his retirement. Enjoy the week! Sharon was very knowledgeable - full of history and anecdotes. She carried a bag with her that contained maps and illustrations to supplement her descriptions. She was very good at adjusting to our needs and interests. She was very professional and I liked her a lot. I would highly recommend her services. TOUR GUIDE RESPONSE: Dear Bernadette, Thank you. It was fun showing you Chinatown ....thank you also for your kind thoughts about my sister. Sharon , was great. My sisters and I looked forward to this trip for many years. Sharon was so knowledgeable and friendly. We never would have seen so much of the city without her. I would recommend this tour to anyone. Money well spent. Great job Sharon is the super and very knowledgeable and great person. Sharon did a wonderful job. She planned everything out, but also gave us suggestions about various things to do and see. She is very knowledgeable about the history of San Francisco and the surrounding areas. Sharon was also extremely friendly and fun to be with. We would - and probably will - use her services again. This was a bespoke tour and Sharon was wonderful. Nothing was too much trouble. She was very accommodating to our requests and offered so many options. Sharon is a great travelling companion and we enjoyed her company and would recommend to any traveller to the San Francisco area. Recommend this tour for Muir Woods. Option for some scenic stops on way to Sauselito. Great day had by all. Sharon very versatile to our requests/needs. Sharon was a delight! Very knowledgeable about the area and attentive to our needs. She recommended a wonderful place for lunch off the beaten path that we would have never thought of, her timing was spot on when picking us up at all the sights we visited. Would use her again in a heartbeat and highly recommend this Monterey Day trip with her! Sharon was super! She has an encyclopedic memory of facts about San Francisco and kept us busy visiting all the sites we wished to see and even some we didn't know about. Highly recommend her! Sharon was very knowledgeable about the city and drove us to locations that were of interest to a teenager as well as a senior. She listened to our earlier requests and was attentive to driving while chatting about the information of various locations. We'd hire her again! Lovely lady - lots of great information! We had a great time and will look to book her for future trips in San Francisco! Thanks for the excellent day!! My daughter (9yo) and I had a wonderful time on this tour. Sharon was very knowledgeable and accommodating. We had a great time & would highly recommend this tour with Sharon! Sharon is very nice and friendly and knows the area well. She tailored the trip to have my 11 yr old and 7 yr old interested. Thank you Sharon. I'd Highly recommend her. A great tour by a knowledgeable guide. Have us loads of information on each of the sites we visited and extra information on sites not in the original plan. It was a very pleasant tour in Palo Alto. Sharon has excellent knowledge on the additional spots to go to other than the typical Big tech firms. I have already recommended the tour to my cousins. Sharon was a delightful guide! She was knowledgable and tailored our tour according to our needs and wishes. We would definitely use her again! Knowledgeable, entertaining, safe, and flexible. Had a wonderful time! TOUR GUIDE RESPONSE: Thank you Mike and Veronica.....I enjoyed meeting you and jimmy too. safe travels! Sharon was extremely knowledgeable about San Francisco. We enjoyed our day spent with her. We never would have been able to see so much and gotten such a good overview of the city any other way. Sharon has all the tools to be a highly qualified Tour Guide and She is a true Local tour Guide. We have a Wonderful day with her. Thank You Sharon! TOUR GUIDE RESPONSE: Thank you so much. Hope you come again soon. Sharon was absolutely best tour guide for us. She has studied our interests and prepared a custom tour where sites of particular interest to us were included. She was also able to accommodate our special requests to pick-up and drop-off at special times due to transport connections. She knows San Francisco history and modern trends very well and tells the story beautifully. Thank you , Sharon for lovely day in San Francisco! Sharon is a great tourguide, she took me to Muir Woods which was very enjoyable and interesting and, wine tasting in Sonoma and other areas of interest (Golden Gate Bridge), she is a great historian so I got to learn a lot about the people and the area. highly recommend her to anyone visiting San Francisco area. TOUR GUIDE RESPONSE: Thank you Ruby, hope you had a good trip home! in the 3 hours we toured different areas of San Fran, especially Chinatown, Mexican area, Italian area and other areas - all very interesting and her knowledge of the Chinese was very impressive. Highly recommend her to all coming to San Fran, you will not be disappointed. Sharon was a wonderful guide to this beautiful city. Sharon is very knowledgeable, and happy to customize a tour for you. We had a great day with Sharon. She is very knowledgeable. Great time with Sharon in the city for 5 hrs. Good knowledge, info and fun. Would highly recommend. Great overview if you are spending a few days. TOUR GUIDE RESPONSE: Thank you. Hope you have a great cruise. Such a pleasure to work with someone who listened to everything we expressed an interest in. Sharon is a true professional and a fount of information. She fulfilled our wish list with the added treat of being very knowledgeable about the history of the area. We would recommend her highly. Sharon was very accommodating, and knowledgeable. I would recommend her tour! TOUR GUIDE RESPONSE: Thank you for taking my tour. It was a pleasure meeting you. Sharon was very knowledgeable and personable. She tailored our tour to our requests. So we did some excellent birding. We also visited the lovely Pelican Inn for lunch. The day went by far too quickly. Will definitely book with Sharon again. We really enjoyed getting a private your from Sharon. She was wonderful, informative, and passionate about her city. We had 4 people in the car, so it was a great value. We had an opportunity to see so many more sites than if we used our cruise tour options, and it was far less expensive. Because t was just us she was able to tailor our tour to our needs, and we even changed destinations on the fly. We were very pleased with our experience. Sharon was an excellent guide. It was very punctual and always worried about serving us well. It has much knowledge and give us valuable information on our visit. It was a real pleasure to do the tour with her. TOUR GUIDE RESPONSE: Dear Alexis, I also enjoyed out tour together. Thank you for the thoughtful review. Sincerely, Sharon T.
Sharon was waiting for us on the wharf. She has extensive knowledge of her tour and told us many interesting facts. We enjoyed our time with her very much. TOUR GUIDE RESPONSE: thank you so much for taking my Silicon Valley Tour and for your 5 star review. The tour was great and Sharon knew things that were so interesting to us...where Jobs lived, facts about the FB headquarters, etc. It would've been great to see inside the facilities we visited but I knew when we booked it that wasn't a possibility. Those companies should work on that! Sharon was GREAT. TOUR GUIDE RESPONSE: Once again, thank you Melony. I hope our paths cross again. Sharon was so knowledgeable. We went on a Muir Woods/Sausalito tour the next day and Sharon's knowledge was so evident! We knew more than the tour guide did! I felt myself giving some color commentary to his points which he probably LOVED. Ha. There were some Australians on our tour of Muir Woods so I'm SURE they appreciated my expertise :) totally learned from Sharon. She's GREAT. TOUR GUIDE RESPONSE: Dear Melony, Thank you for your kind words. It was my pleasure to show you a little bit of Silicon Valley and San Francisco. Please come again! Sharon was extremely personable, knowledgeable and fun to tour with. She made every effort possible to make our tour of San Francisco the best it could be. She was also very prompt in responding to inquiries via email, etc. - great to work with. Would recommend her highly. TOUR GUIDE RESPONSE: Dear Deborah, Thank you for your kind words. I had a wonderful morning with you all and hope you had a safe trip home. Hope your San Francisco stay was everything you had imagined. All my best, Sharon T.
We had a terrific time seeing Muir Woods and San Francisco with Sharon! What a classy and informative adventure! We saw many of the city's best sights from the view of a native! Sharon also recommended great places for lunch and dinner where we become friends. What a relaxing way to see the city! Hope to see Sharon and San Francisco again soon! TOUR GUIDE RESPONSE: Dear Joanne, thank you so much for your kind review. We had a very special day. I hope you will come back soon and we can explore another part of the bY area together. Sharon was very knowledgeable, and we had a fantastic time on our 5 hour tour. Plenty of wow places we saw. No hurry and we felt like we had to come to San Francisco again. We would recommend Sharon, she is an excellent tour guide with passion. Thanks Sharon we loved our day out with you, you're a credit to your profession. Did a great job very personable friendly on time knowledgable we loved her thanks so much..
We had a very good tour of Silicon Valley. Sharon has a very good personality and was very well-informed. She was very punctual and flexible. We really appreciated her combination of friendliness and professionalism. We had a very good trip with her and wouldn't hesitate to use her again. Sharon is a wealth of great information. Sharon exceeded our expectations. We were amazed at how much she knows about San Francisco. Sharon tailored this one to us just perfectly. We wanted to spend time in Muir Woods and to learn about how quality wines are made. She picked the perfect winery for us. It matched our desire to see ecologically sound farming practices producing excellent varietal wines. We had all the time we wanted in Muir Woods. And, she was ready with more ideas if we had wanted to see more. Excellent overview of the city with enough stops but not overwhelming. Covered a lot of territory.